From the autumn of 2016 to the spring of 2017, researchers at the Ontario Health Coalition called private clinics right across Canada. Included in the survey are private surgical clinics including cataract surgery clinics, MRI/CT, colonoscopy/endoscopy clinics and “boutique” physician clinics. In total, we surveyed a sample of 136 private clinics in 9 provinces. From our interviews, we found 88 clinics in six provinces that are charging patients extra user-fees and selling medically necessary services. In addition, we surveyed 400 individual patients about their experiences with user-fees. In response, 250 patients detailed extra charges that they faced when trying to access needed medical care in private clinics. Patients described these medical fees as ‘a shock’ and ‘a hardship’. A substantial number of those who participated are seniors – into their 80’s and 90’s who share stories that include their monthly pensions being wiped out due to fees for medical services. “Such fees are unlawful under the Canada Health Act, which forbids extra-billing of patients and requires that all Canadians receive medical care based on need. Both clinics and patients were asked about extra user-charges for needed health care services. Under the Canada Health Act such user fees are forbidden. But we found evidence that at least 88 clinics in six provinces are charging extra user-fees. Two-hundred and fifty patients detailed instances in which they have been charged for care. Fees charged to patients were exorbitant, much higher than OHIP costs, ranging from hundreds to thousands of dollars per patient. Patients, many of them seniors, told us that the fees were a shock and caused them financial hardship.” stated Ontario Health Coalition’s Executive Director, Natalie Mehra. 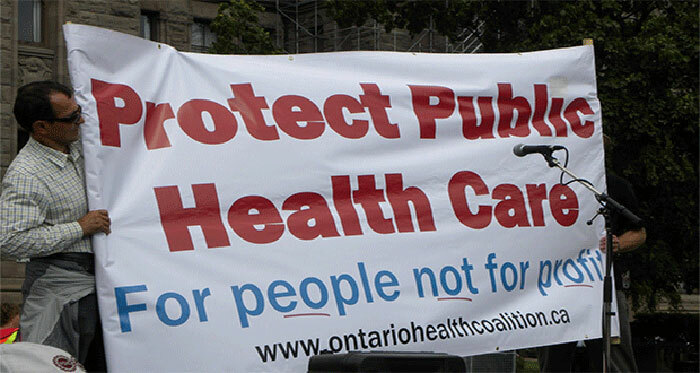 Health Coalitions and public-interest advocates across Canada are warning that challenges to public health care posed by private clinics have come to a head, and unless governments act to protect patients, public health care is at risk. Natalie Mehra is also the author of the substantive report, which outlines several examples of double-dipping by clinics, where the public medicare system is billed as well as the patient. ‘Under Canada’s Public Medicare system, provinces are responsible for meeting the conditions and criteria of the Canada Health Act, including the Act’s prohibitions on user fees and extra-billing of patients that protect equity in access to care. Provincial governments have a duty, therefore, under Canadian law, to ensure that residents are not faced with user charges when they visit a doctor, a hospital or a clinic. Located almost exclusively in the most affluent neighbourhoods of Canada’s largest urban centres where there is a wealthy ‘market’ for their services, so-called ‘boutique’ clinics sell a variety of medically necessary tests and procedures co-mingled with medically unnecessary services in an attempt to sidestep the Canada Health Act’s prohibition on user fees. ‘As a rule, these clinics charge extremely high fees for access to their services, and, as per the Toronto Life story, are often marketed for their exclusivity. Some clinics require health cards and bill both the public health care system and patients. Other clinics do not require a health card and charge patients directly for all services.’ The report especially provides investigation into Private MRI Clinics, Private Surgical/Colonoscopy/Endoscopy Clinics, and Private Cataract Surgery Clinics. “Privatization is a failure. Its time to rebuild capacity in our community hospitals that operate on a non-profit basis in the public interest and insist that our governments plan for and resource our public hospitals to provide the services we need.” Stated Mehra.